Ten years ago skyr – prounced skeer with a trill on the r – barely registered in the world’s yoghurt market. Now, according to global business consultants Future Market Insights, the market for skyr is worth nearly $8bn (£6.4bn) a year and growing fast. The skyr boom first took off in the US and Scandinavia and could sweep into Asia after a recent visit to Japan and China by Icelandic dairy farmers. Skyr first went on sale in British supermarkets in 2015 and is on the up and up, a popularity that could also be about to be boosted by Arla, one of the world’s biggest dairy companies, which will advertise skyr on TV in January, the month when yoghurt sales are highest. The biggest producer of “authentic” skyr, MS Dairies, has also identified the UK as its largest growth market. It is owned by 700 Icelandic farmers and has tried for two years to have the skyr trademark protected, like Parma ham or Stilton cheese. It failed and this has allowed big dairy companies such as Arla and other smaller entrepreneurs to cash in on the boom. So why has something that has been around for a thousand years taken off at the breakfast table? Iceland’s tourism boom has helped to spread the word, so has a big push from Starbucks and the fact that skyr is thick enough to be eaten “on the go”. But the main reason is what Arla calls skyr’s “three credentials” – low sugar, no fat, and high protein content. Although it is marketed as a yoghurt, skyr is technically a soft cheese made from skimmed milk. After the whey has been removed by ultra-filtration it is so thick that a spoon will stand up in it. A culture of lactic acid bacteria is added, and the process from cow to supermarket shelf takes three to four days. The “skyr is good for you” message is broadcast in Scandinavia by Eidur Gudjohnsen, the footballer who scored more than 70 Premier League goals for Chelsea and Bolton, and won the Champions League with Barcelona. He and his father both played for Iceland, and both have eaten skyr all their life. Arla started selling skyr in Asda last year, and when it launched last year with an advert filmed in Iceland it irked MS Dairies. Like the skyr sold in the US, Arla’s product was not made in Iceland, and the media in Reykjavik wrote of “skyr wars”. But Iceland cannot meet demand. It takes 3.5 litres of milk to make one litre of skyr and there are only about 30,000 milk-producing cows in Iceland. There has been talk of importing bigger cows, but it seems unlikely. MS, which produces under licence in Denmark and Norway with local milk and will have to do the same in Britain, started selling its skyr.is brand in Waitrose earlier this year and has just shifted its two millionth pot. Arla has had a good year in Asda, Tesco and Sainsbury’s. Lidl recently joined in with its own brand which, at 49p, is far cheaper than the “authentic” skyr, which sells for £1.25 in Britain and £2.50 in Norway. UK sales are dwarfed by those in Scandinavia and the US. In Norway and Finland, where the courts allowed MS to protect its skyr by trademark. In Iceland annual consumption is measured in kilos per person. Iceland’s farmers are making good money – from zero to €70m (£60m) in exports in five years and a 23-fold increase in production. And so are the dairy giants. But not as much as Siggi Hilmarsson (left), an Icelandic entrepreneur who gave up his job at Deloitte in New York after he started making skyr in his own kitchen. 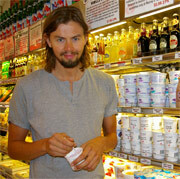 His mother sent him a recipe from a 1960 women’s magazine she had found at the national library in Reykjavik, and Siggi’s is now the fastest-growing brand in a US yoghurt market worth $9bn a year, selling in Starbucks and Whole Foods shops. Hilmarsson had two outlets in 2006 when he started; now he has 25,000. “After graduating I had a corporate job that I didn’t really like and I started making yogurt as a hobby because I missed eating skyr from home,” said Hilmarsson, who has lived in the US for 14 years. “I asked my mum to find me some recipes. “I realised there was a market for healthy food with lower sugar content, and especially lower sugar yoghurt. Greek yoghurt is similar in texture but has much more sugar. We have no additives, low sugar, high protein. It’s all clean ingredients.